July recognizes Purposeful Parenting Month, which highlights the significant relational value of parents and children having resilient and meaningful connections with one another. 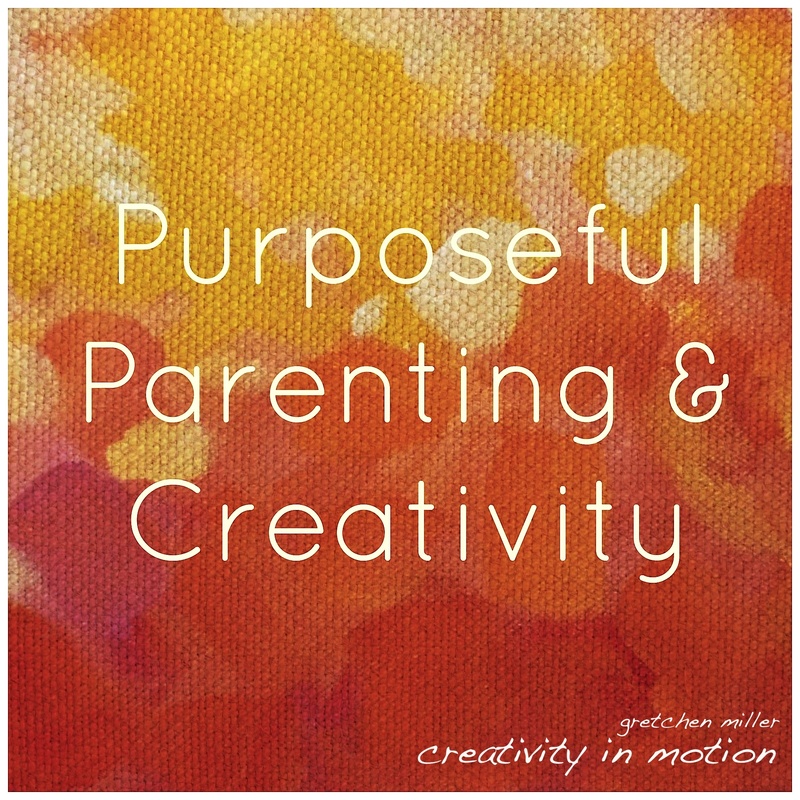 Purposeful Parenting embraces understanding, unconditional love, and empathy with the consistency of structure, safety, and healthy boundaries. To parent with purpose is to be an active contributor in sustaining rapport, connection, and intention with your child or teen. One of the group offerings I facilitate is an art therapy group for moms living in a shelter with their children as they work on transitioning out of homelessness. This art therapy group is part of the shelter’s trauma informed parenting support program as an opportunity to receive nurturing assistance during this challenging time to strengthen coping, self-care, and explore empowering ways to sustain an affirming relationship in their child’s lives. The power of art and the creative process offers a safe place to address these topics. Over the years that I’ve been involved with this program, I’ve met moms of amazing strength and resilience, not only committed to creating healthier relationships and attachments with their children, but often working on their own trauma recovery. For children who have experienced trauma and loss in their young lives, having adult attachments that engage with purpose and compassion can be a key component to their healing. Perry & Szalavitz (2006) speak to how a child’s relationship with the adults in their lives has an essential component to how they react to trauma. They also note that if a child is surrounded and nurtured by caregivers who are safe, comforting, dependable, and present; this can help protect youth from the adverse effects of trauma, as well as strengthen their ability to recover. “Recognizing the power of relationships and relational cues is essential to effective therapeutic work, and indeed, to effective parenting, caregiving, teaching, and just about any other human endeavor.” (p. 67, The Boy Who Was Raised as a Dog). Ohio’s American Academy of Pediatrics identities six components to purposeful parenting for parents and caregivers to keep in mind. Being Protective, Personal, Progressive, Positive, Playful, and Purposeful in our relationships decreases the impact of chronic stress exposure and ultimately supports a child’s fullest potential and well-being. Painting with Bubbles or Shaving Cream: These sensory-based twists on painting can encourage play and experimentation between child and parent using simple, inexpensive materials. Levine & Kline (2008) cite that activities involving art expression such as painting and drawing are great bonding opportunities for parents to engage in alongside their children. Sidewalk Chalk: Grab a bucket or box of sidewalk chalk, head outside and take a break to chalk it up together—at home, a local park, or playground! Suggested ideas to support collective participation in this activity include drawing where the child and parent can add to one another’s images, marks, or doodles. If you are up for making your own sidewalk chalk, here’s how. Families can also play these classic sidewalk chalk games. Nature Walk & Scavenger Hunt: Parents, young children, and teens can benefit from unplugging and taking time to enjoy the outdoors, fresh air and reconnect! Take a walk in nature, go biking or hiking together. Create a scavenger hunt of different nature items that the family can look for and find as a group or in pairs. Homemade Play Dough and Goop: Spend a morning or afternoon making a batch of play dough together, or for older kids goop recipes can be equally as inviting and fun. You can even make scented play dough, which can add an additional sensory component to this experience. Visit an Art Museum, Art Festival, or Creative Community Event: Check out your local art museum or art event as a family outing. Many museums have family related programming or guides that can help enhance your experience! Here in Cleveland, the Cleveland Museum of Art’s Gallery One offers a hands on, interactive family-friendly art space called Studio Play. And it’s free! No matter what the month or season, there is true power in the relationships we nurture for the children and teens we care for, either as parents, caregivers, or helpers. It’s important to keep enriching these healthy attachments by cultivating safe experiences and moments of meaning all year round. Perry, B.D., & Szalavitz, M. (2006). The boy who was raised as a dog. New York: Basic Books. The Safe House– I have included this book when working with youth from violent homes on making paper houses around the theme of safety and what makes a house a safe home. You can learn more about paper house making with youth exposed to domestic violence here. Hands Are Not For Hitting– I like to use this book with younger kiddos, between 4-6 years old to help discuss helpful and & kind ways we can use our hands instead of choosing to be hurtful. Often the story is followed by the children in the group tracing their own hands, decorating them with crayons or markers to include with the many ways we’ve discussed about how their hands can be used in positive, respectful, and non-violent ways. A Place for Starr: A Story of Hope for Children Experiencing Family Violence– This book tells a young girl’s story about her mother, brother, and her leaving their home of domestic violence to the safety of a shelter. The book is now out of print and any available finds are quite expensive to purchase, but if you come across an affordable copy somewhere, I recommend it highly! I am super thankful to have a copy for my collection- I have found this book helpful for opening up discussions and art-making around the experience of coming to a shelter. Is It Right to Fight? – The content in this book looks at aggression & anger from a variety of perspectives such as bullying, fighting between adults, war and prompts the group/child with questions to explore decisions, situations, and ways we can manage our anger or conflicts without fighting & violence. When I’m Feeling…. series – This series features 8 different books about the feelings scared, sad, jealous, happy, loved, kind, lonely, & angry in very simple & short illustrated stories, which is great to use with young children to explore emotional themes. When we’re going to work on something like Worry Dolls, the When I’m Feeling Scared book is a helpful introduction to learn more about or normalize the feeling. My Many Colored Days– This book is another favorite of mine: I love the images and descriptions of emotions associated with the different colors– My favorite is the green, calm & cool fish! Lots and lots of possibilities for art-making to promote emotional expression inspired by this classic Dr. Seuss book! Check out this PDF resource supporting social emotional development using a variety of arts based and hands on activities with this book. Life Doesn’t Frighten Me– Maya Angelou’s amazing poem meets the awesome art illustrations of Jean-Michel Basquiat in this very inspiring book that tells the story of fearlessness and resiliency. The narrative from these pages sets a great foundation to do some art-making about our strengths and supports. Courage– This children’s book I’ve used not only in my professional work to introduce what courage is to the youth I work with, but it has also inspired my own creative work! It’s a great story for adults to be reminded about too and both children & grown ups alike can benefit from creating Couarge Coins! When I Grow Up– I initially bought this book at a local toy store in Chicago many years ago because I really liked the creative illustrations with black and white photographs of children’s faces, but then fell in love with it’s entire concept surrounding the cliche question: What Do You Want to Be When You Grow Up? Instead of focusing on the typical answer of an occupation or vocation, this book suggests another thoughtful perspective (and fun pictures) such as growing up to be brave, adventurous, generous, imaginative, curious, optimistic, patient, & more. It’s a great book to explore how we feel about ourselves (and future selves), as well as how we want to treat others. Both of these books below are really valuable to help introduce what trauma is, trauma reactions, and learning how to manage traumatic stress through an animal character based story. After reading and having a discussion about the book, I often invite kids to create art expressions about what they think happened in the story. Brave Bart– A resource on activities and ideas on how to use this book with grieving and traumatized youth can be found here from the National Institute for Trauma and Loss in Children. Make Someone Smile and 40 More Ways to Be a Peaceful Person- This book inspired some of messages for Peace Flags that one of my groups about Peacemaking created a couple of years ago from handmade paper pulped from hurtful bullying messages. The Peace Book– A great introductory book to start exploring simple, but meaningful ways that we can bring peace to others & the world around us! I like to prompt group members to think (and create about) what peace means to them as an individual, in our group, to others they know (at home, school, their neighborhood), and what peace means globally in the form of a flag,, shield, or mandala. I hope this list and ideas were helpful! 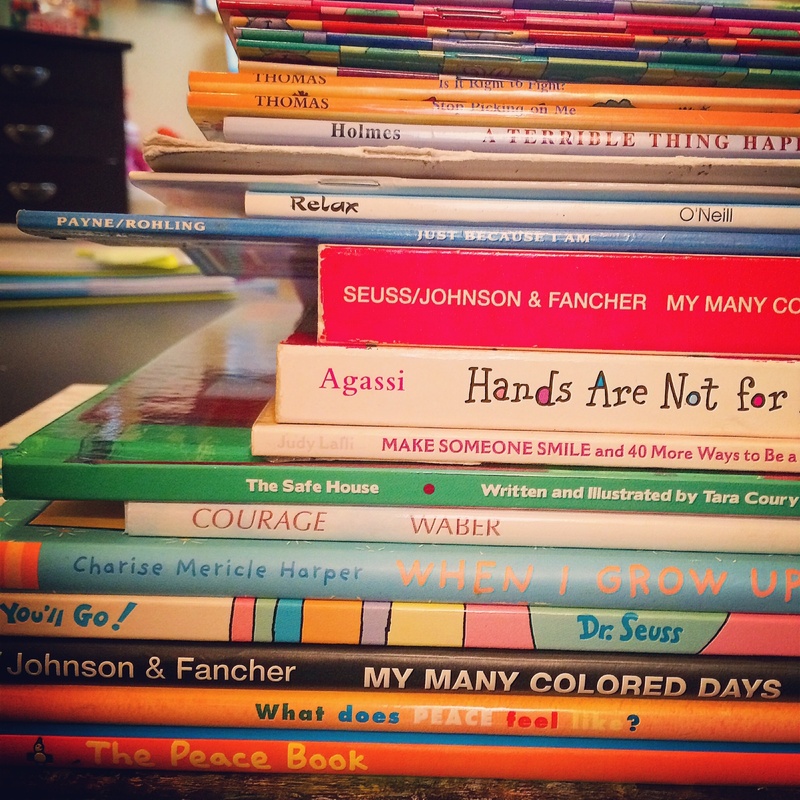 A lot of books listed above are linked to one of my favorite resources, The Self Esteem Shop, who supports trauma informed work through carrying many of these children’s books and more. I hope you will check some of them out, or if you use them already (or others!) share your experiences below! Over the last few months, I’ve been researching and collecting different sensory based activities and ideas (mostly on Pinterest) to support self-regulation and creative ways to foster relaxation in children & adolescents. My long term goal is to create some kind of comfort kit that includes a variety of these hands on tools that I can use in my group work with school age youth impacted by trauma. I’ve started to move from the “collecting ideas phase” to the “making & experimentation phase”, embarking on trying out these ideas myself to see how they might work. My first self-regulation comfort kit accessory I’ve started to work on and play with is a Relaxation Bottle. I became inspired by this idea through discovering this helpful post. 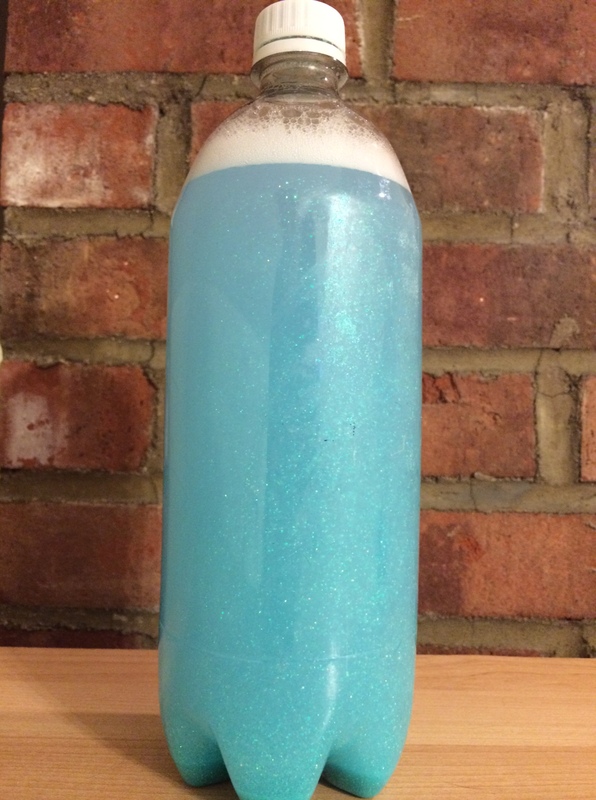 I thought this type of relaxation bottle could be a soothing and fun way for group members to calm their minds and bodies, as well as help bring their attention to the here and now through focusing on the inside of the bottle. 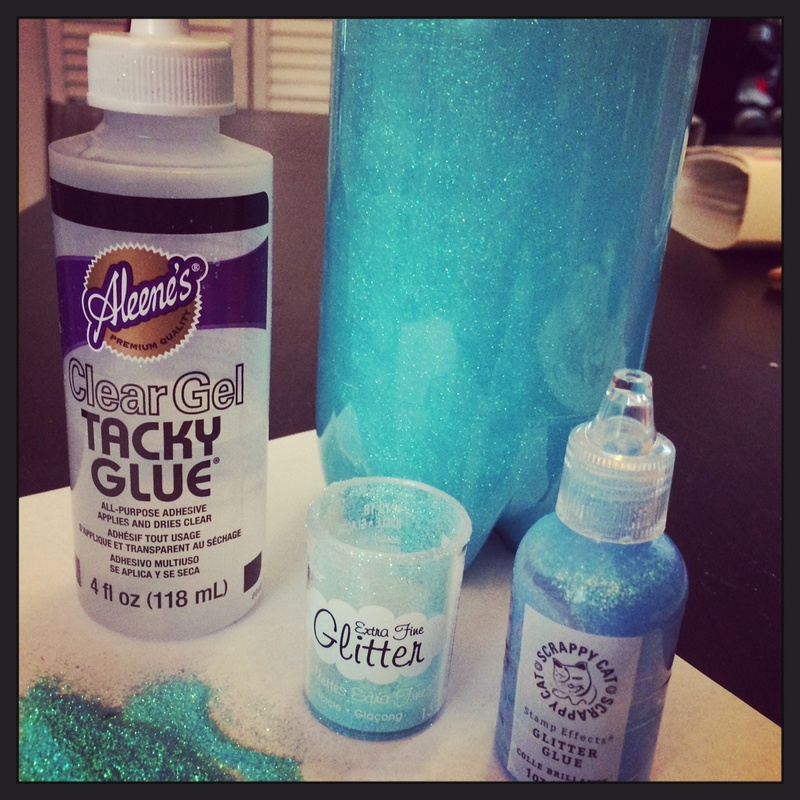 I gathered these simple supplies: A plastic bottle, extra fine glitter, glitter glue, and clear tacky glue. The combination of the glitter glue and clear tacky glue creates a sparkly solution for the fine loose glitter to gently dance in. It is important the water you use to fill the bottle with is hot, as this will melt the glitter glue and will prevent clumping inside the bottle. Group members could first release some physical energy through helping shake the bottle and then watch the glitter slowly settle to the bottom of the bottle. Discussing the impact of this activity in relationship to the youth’s body and awareness of sensations they experienced would also be interesting to learn more about (and express through art!). A helpful final touch will include making sure the bottle’s cap is permanently attached with some kind of superglue to keep the solution from getting out! Having done this first test run, I think my next attempt will try a slightly smaller plastic bottle (it would be cool to have individual bottles for each group member to use), as well as include more glitter glue to make the solution inside a little thicker (I used a smaller sized bottle), but overall… the relaxation bottle idea was fun to make and I think will make a great addition to the toolkit I’m creating. I will keep you posted on other self-regulation comfort kit accessories I try out as this experimentation phase continues! 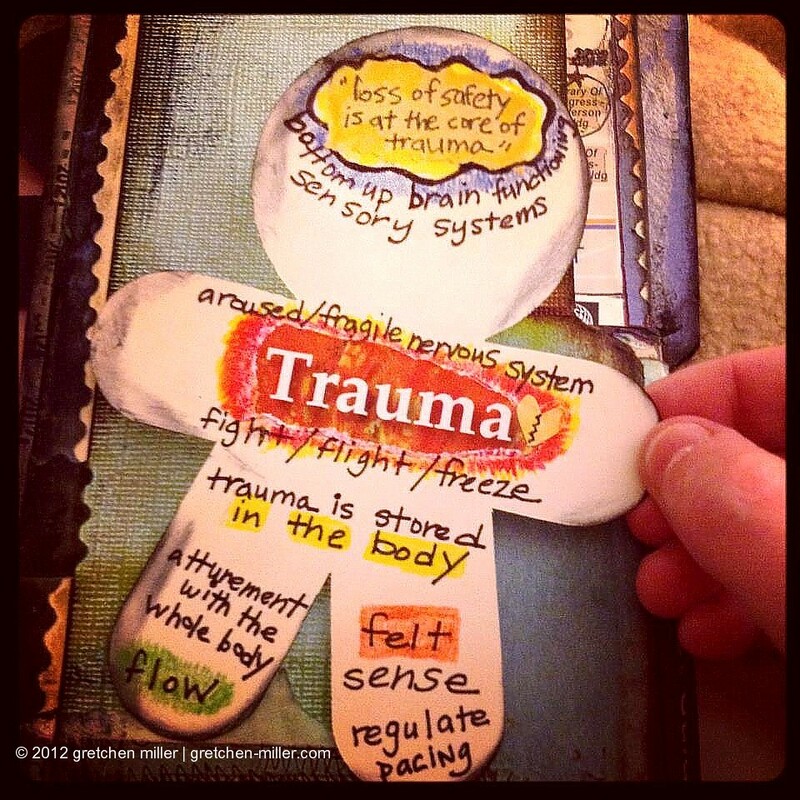 In my children’s Trauma & Loss Art Therapy groups, we explore common trauma reactions that can surface after something bad, sad, or scary happens that takes away a child’s sense of safety and security in their world. I often use trauma informed children’s books such as Brave Bart or A Terrible Thing Happened to help introduce and educate children about the different emotional, physical, and behavioral responses they may be experiencing. As described in both stories through the characters Brave Bart the Cat and Sherman the Raccoon, one of the traumatic stressors can be difficulty sleeping or becoming afraid to go to sleep because of nightmares and bad dreams. 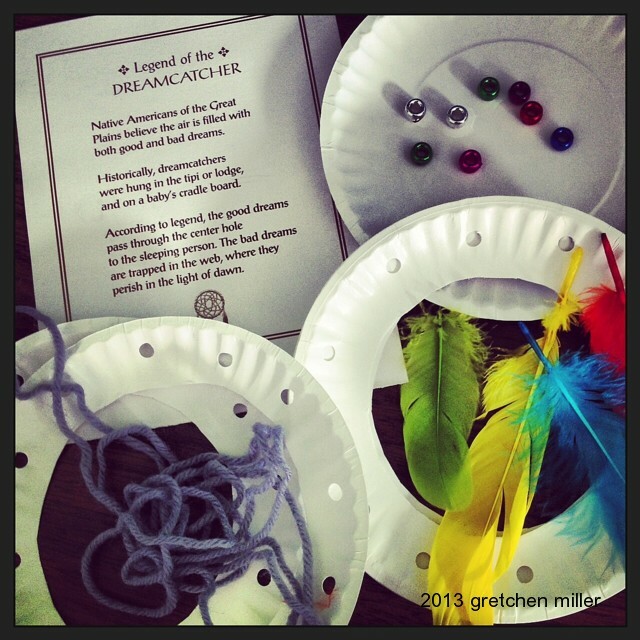 I find creating dreamcatchers are an easy, fun, art-based activity to make together as a group, as well as provide a creative, meaningful way to address fears and worries related to exploring this topic. When introducing dreamcatchers, I often prepare paper (or styrofoam) plates (small or large in size) by cutting the center out, and punching holes around the edge. Kids can also help and do this part too! The circle form can then be decorated with markers, oil pastels, foamie shapes, paint, or collage. Yarn is used next to thread through the punched holes, creating a criss cross pattern back and forth over the center of the circle to create the dreamcatcher’s web. 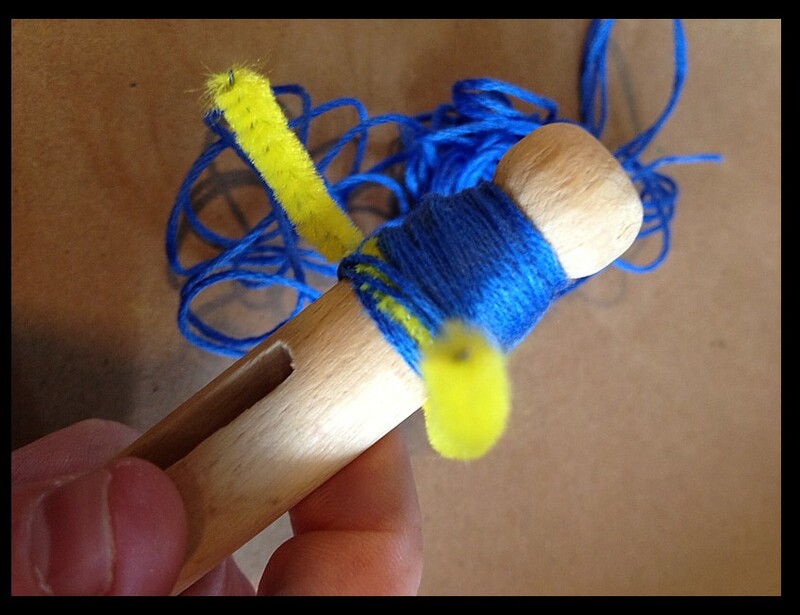 A small piece of yarn is left hanging off the circle’s edge, where a series of pony beads can then be strung together. To complete the dreamcatcher, a few feathers can be securely attached inside the bead’s inside to hang down. 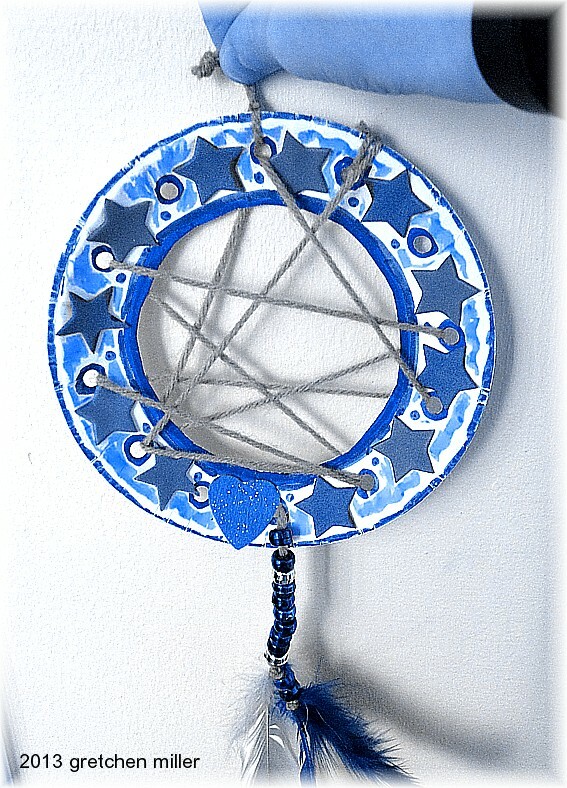 Some dreamcatchers have multiple beads and feathers attached to the bottom. Step by step photo tutorials and other ideas when making paper plate dreamcatchers can be also be seen here, here, and here if you are interested in seeing more examples! 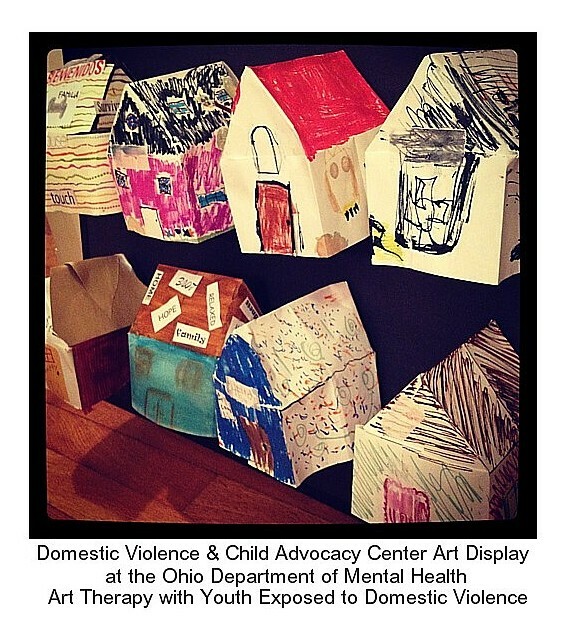 Earlier this year I was invited by the Ohio Department of Mental Health (ODMH) to display some of the art from youth that I work with in individual and group art therapy at the Domestic Violence & Child Advocacy Center (DVCAC). ODMH showcases quarterly art displays from various programs and consumers from around the state in their Columbus office at the James A. Rhodes State Office Tower. According to the ODMH website, ODMH “works to assure access to quality mental health services for Ohioans at all levels of need and life stages”. One of ODMH’s core beliefs is a commitment to Trauma Informed Care, as well as the Resiliency of Youth. Check out both of these links on the ODMH website to learn more and access their recommended resources. The display from DVCAC runs October 1 through December 31 and features art expressions from children & adolescents who have been impacted by domestic violence and are involved in group or individual art therapy through DVCAC’s community-based outreach program. Art on display explores themes related to safety, resilience, emotional expression, domestic violence prevention, and managing trauma stress. 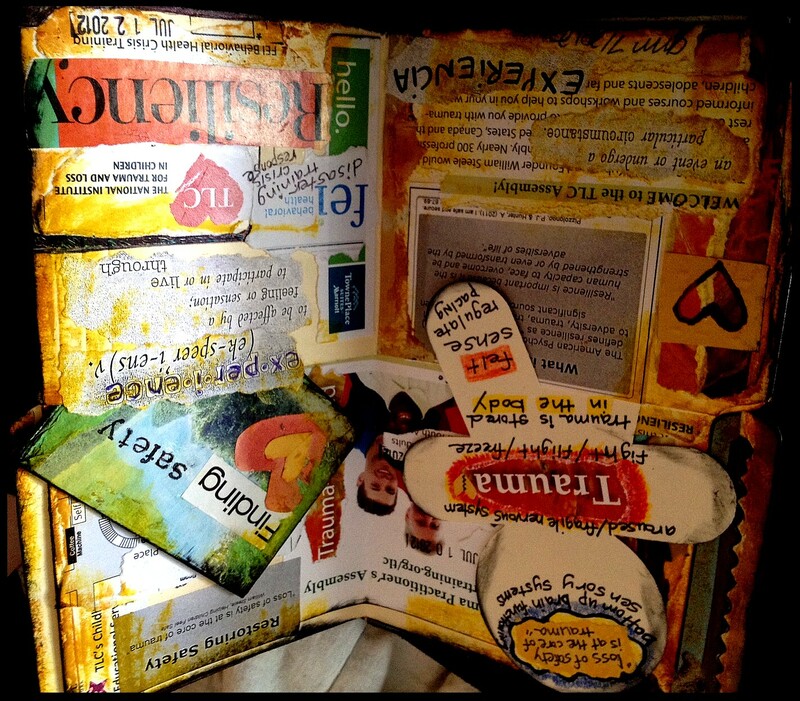 Art expressions include collage, drawing, painting, handmade papermaking, paper house making, and mask making. Click on the image below to download a flier [PDF] about the display. The timing of this exhibit’s start is also aligned with October being recognized as National Domestic Violence Awareness Month. Look for related DVAM posts to be featured here on Creativity in Motion throughout this month, as well as resources about domestic violence collected on my trauma informed pinterest board. If you are in the Columbus area over the next three months, take a moment to visit ODMH and this display. My appreciation to the youth who participated through sharing their art, feelings, and a part of their life to empower their own voice, as well as bring awareness to others about their experience. Inspired by my work with and the mission of Peace Paper, over the last few months I have been incorporating handmade papermaking with some of my art therapy work with youth who have been impacted by trauma and loss. One way we used the transformative process of papermaking over the last few months included expressing some of the emotional burden of experiencing or witnessing someone being bullied. 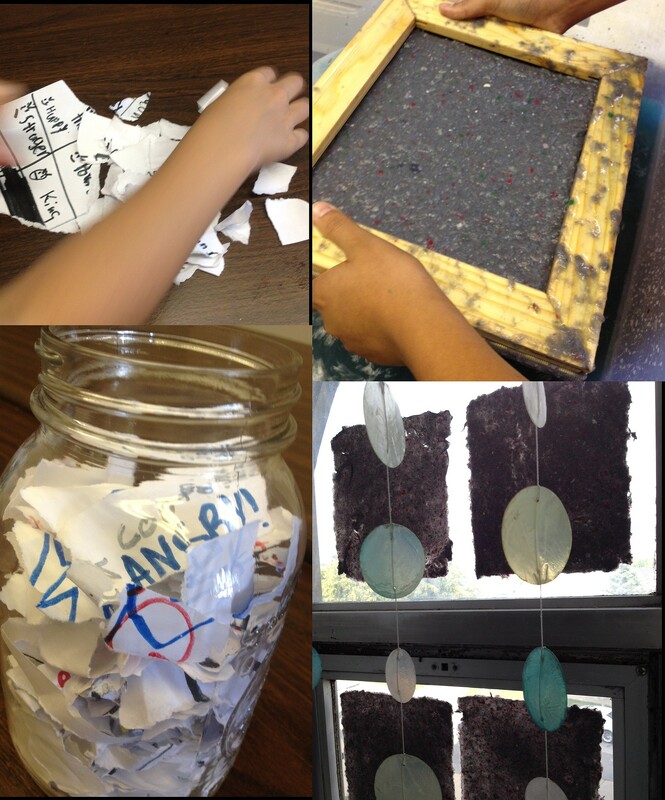 Youth ages 6-12 created and then tore up images and hurtful messages about bullying to destroy in a blender for pulping. The pulp from this was then used to form new sheets of handmade paper that would become decorated as Peace Flags. The process of destructing the negative & re-constructing it into something positive was really powerful. The Peace Flags also served as a visual reminder and a way to dialogue about how each of us can choose to engage in peaceful and less hurtful behavior with one another. 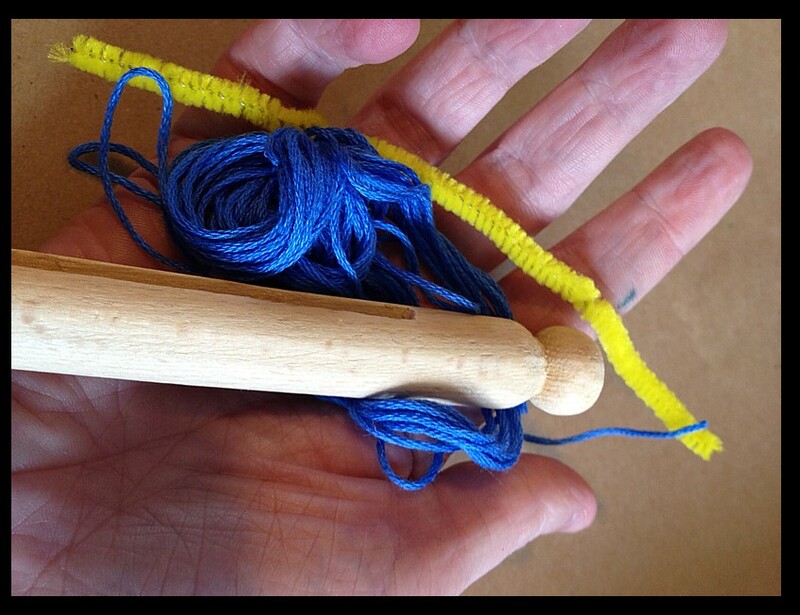 Also check out the work of Peace Paper, their papermaking tools, tutorials, and resources at www.peacepaperproject.org. I just spent the last week in Clinton Township, Michigan attending the National Institute for Trauma and Loss in Children’s 2012 Childhood Trauma Practitioner’s Assembly, Experience Matters. The above image is a spread from one of my file folder bluebooks I am currently working on to visually document some of my travels and adventures in twentytwelve. This spread includes printed material and paper stuff I collected throughout the week at the conference, some items from the sessions I attended, the hotel I stayed at, a little distressed ink, Staz On ink, as well as using my Smash Stamp and Smash Stick. It was lots of fun to collect stuff, play with laying it out, and glue it all together! I also created the image below as a creative way to take notes on a session I was attending about implementing a trauma group for adults. The pre-cut figure shape fits really nicely in one of the file folder gluebook pockets! 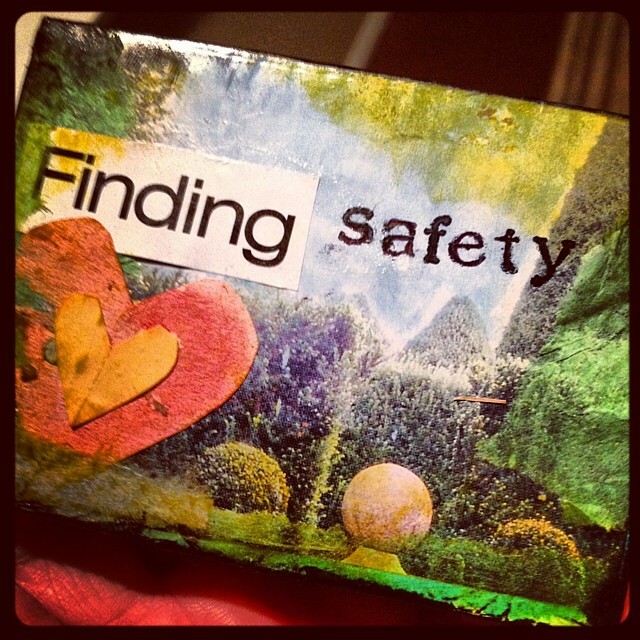 In the workshop I presented, Finding a Safe Place: Creating Safety for Survivors of Domestic Violence through Art, attendees spent some of the session making a portable safe place in the form of an artist trading card with various collage materials. This special ATC serves as a symbolic safe place or image that can travel, become mobile, or easily be carried as a visual reminder and grounding tool for well being, comfort, and emotional safety. This ATC can also be displayed on a mini-easel, bulletin board, ones workspace, a nightstand, or become part of a journal (or for stashing in a file folder gluebook pocket!). I’ve also pinned some content inspired by this year’s Assembly and workshops I attended on my Pinterest board about Trauma if you are interested in checking out any additional resources! 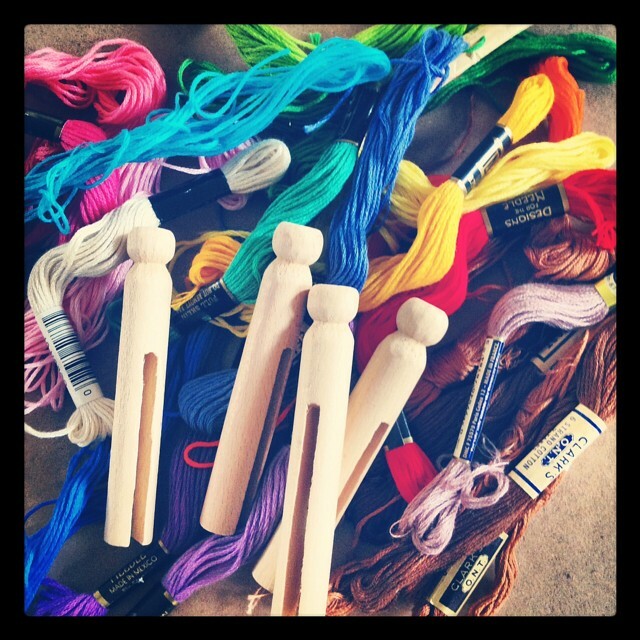 My week started off with some Worry Doll making for one of my groups. I forgot how much fun they can be to make! 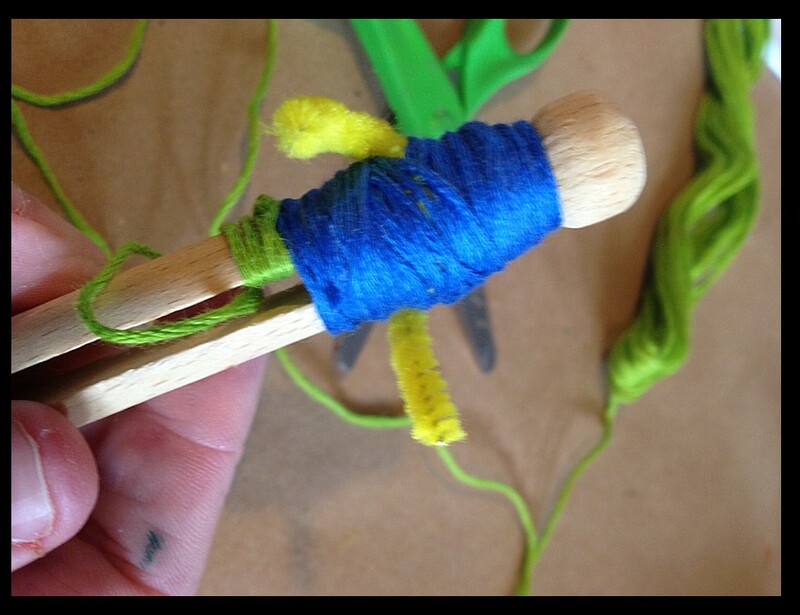 Wrap & twist a pipecleaner around the clothespin to create arms. Cut to size for arm length. 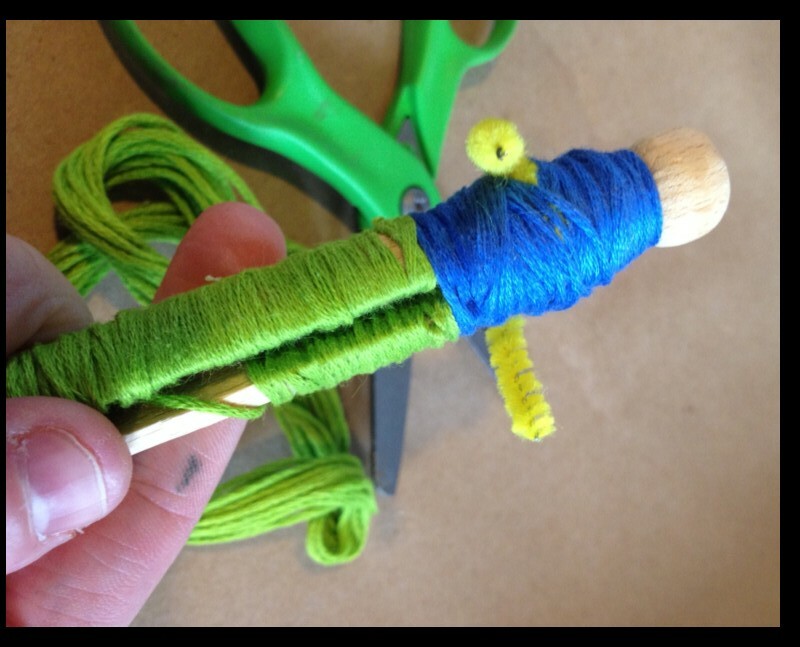 Begin wrapping your clothespin with yarn. 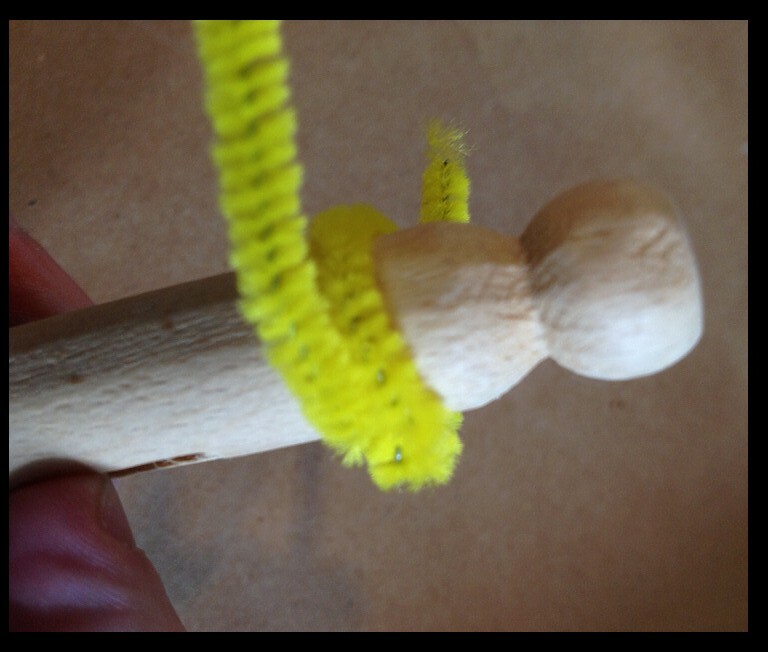 Wrap over the pipecleaner as well. Use markers, colored pencils, or paint to add a facial expression, hair, skin tone, shoes, etc. 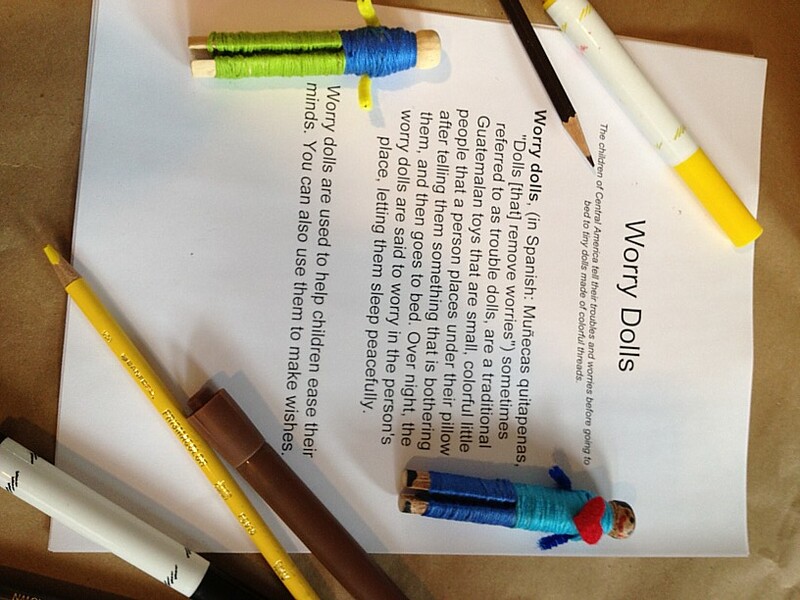 I’ve created worry dolls with many youth throughout the years as not only a fun art experience (as seen in The Kids’ Multicultural Art Book: Art and Craft Experiences from Around the World), but in my work as an art therapist, the process is also a meaningful and creative way to explore themes connected to anxiety and worry. 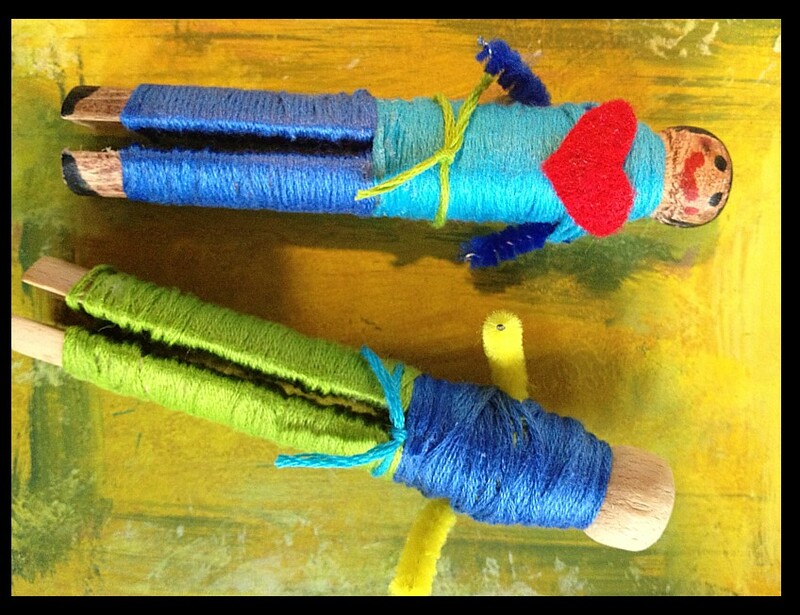 Making worry dolls provides a great opportunity for storytelling, to discuss coping, and the repetitive, patterned nature of wrapping the yarn around the clothespin can be soothing and calming.